In a small compass... | Don't look back in anger. Posted: February 24, 2019 in Flash Fiction, Oh. My. Dog! A look of absolute disgust briefly crossed the lady’s face. “Mortimer, inform Charlotte that she has visitors.” She stood, and picking up her trade journals, she headed for the door. Lynx seemed utterly unfazed, whereas Paul Cairns tried to remember if he had ever met someone as ill-behaved. Hurried steps and “Lynx, this is really you!” interrupted his train of thoughts. The young woman hugging Lynx was the opposite of her mother, outgoing and kind. Lynx whispered something in her ear. The Viking collection was in an annexe of the building, Charlotte and the cleaning staff were the only ones who knew its exact location; moreover, it was not monitored by security devices. Posted: February 17, 2019 in Flash Fiction, Oh. My. Dog! Bud laid his paw on my knee. “That’s brilliant!” Fondling Bud’s ears I elaborated my plan. A few minutes later Lynx left for a change of clothes, Annie sent a grumbling Paul to dress up appropriately for their visit at the Barker-Worthingtons. Thanks to announcing their visit beforehand, a gleaming borrowed Jaguar, Lynx and her charming smile, she and her “uncle” Paul were allowed along the driveway to the house. A butler in livery opened the front door and led them to the salon. Lady Barker-Worthington reciprocated the niceties with a smile that did not reach her eyes. Posted: November 3, 2018 in Flash Fiction, Oh. My. Dog! Posted: October 21, 2018 in Flash Fiction, Oh. My. Dog! While we were talking, Mr Cairns hat quietly joined us at the table. When I started explaining Bud’s finding, he got really excited. Lynx agreed with me. She stared at the mirror, taking in how it was attached to the stick. Frowning, she grabbed a napkin and lifted the mirror for a closer look, turning it in different angles. You could have heard a pin drop when she finally smiled into the round. Posted: October 7, 2018 in Flash Fiction, Oh. My. Dog! Mrs Cairns sobbed and her husband hurried to hug her. Posted: July 22, 2018 in Flash Fiction, Oh. My. Dog! As usual, I had an old knotted leather-belt with me – Bud loved chasing for it. After I had thrown in for the second time, Bud returned with the belt and something muddy which he carefully placed in my outstretched hand. I carefully removed some of the dirt. Weird. A broken mirror tied to the end of a stick. Bud laid his paw on my knee. Bud directed me through the gate towards the garden hose, he was eager to get the mud out of his fur and – off the mirror/stick contraption. When Mrs Cairns and Lynx returned an hour later, the car was filled to the brim. Both looked exhausted so I rushed outside to help them. Mrs Cairns invited us for a treat. She exchanged some quick glances with Lynx, urging her to tell Bud and me about their morning at the plant nursery. 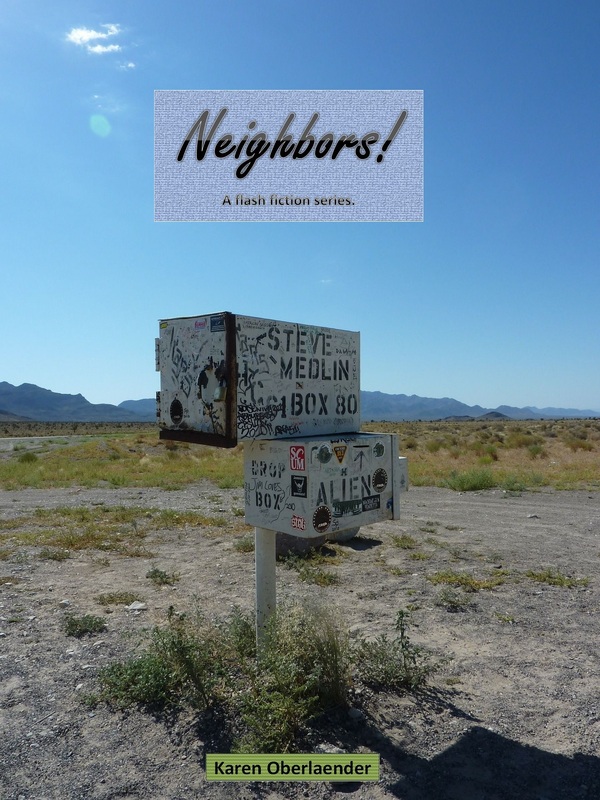 It has finally happened: My second book, Neighbors!, was published today, June 19, 2018 as a multi-format ebook by Smashwords. As many of you may know, the book is a flash fiction series, focussed on Sheriff Jim Burrell and a peculiar case. It also comprises a bit of fan fiction: author C. S. Boyack lent me my favourite protagonist of his works, Lisa Burton, to support Sheriff Jim. I hope you will take the time to check Neighbors! out at your retailer of choice or at Smashwords, where you can buy and download the book in the typical ebook formats. Neighbors! is available at many retailers. Mobi format is available at Smashwords. Tags: cover reveal, flash fiction series, Neighbors! I loved writing about sheriff Jim Burrell and his team, including Lisa Burton, C. S. Boyack’s unique protagonist of Wild Concept. Dear Craig, I still feel honoured that you allowed my piece of fan fiction. I can imagine to continue the story – with a different case of course – if you readers want it. During the last months I took my time to format, re-edit, etc., and Smashwords accepted Neighbors! for their Premium Catalog. Enjoy reading the episodes at the coffee machine or in the lift (perhaps I should say elevator – as Neighbors! is set in the USA 😉), or just wherever else you like to read. Posted: April 29, 2018 in Flash Fiction, Oh. My. Dog! I woke to the smell of coffee. Not sure if I was hallucinating, I squinted; broad daylight, the scent of coffee and cinnamon rolls seemed to be real. Noiselessly, I leant on my elbow. Lynx was sitting at the table, reading, a coffee mug in her left hand, her right hand petting Bud’s head. His head rested on her leg, both were completely at ease, and I just loved the sight of it. My growling stomach gave me away. Lynx looked up, smiling. I got up and Bud trotted over to greet me, then he directed me towards the bathroom. Ten minutes later and freshly showered I finally was allowed a seat at the table, fresh coffee and a delicious cinnamon roll. I was glad that the case was over, still feeling a little exhausted – lack of sleep had taken its toll. “Not in the mood for adventures, right?” Her eyes sparkled as she said it, even Bud seemed to be grinning. “Besides learning for the upcoming tests, I promised Mrs Cairns to help her stock up for the garden show. An extra pair of hands is required.” Lynx smiled infectiously and Bud produced his silent bark. Posted: February 18, 2018 in Flash Fiction, Oh. My. Dog! All of a sudden I felt worn out, therefore I accepted Mr Cairns’ offer for a ride. Jones promised to return my bicycle the early afternoon. It was a relief to snuggle into the front passenger seat. I stole a glance at Mr Cairns’ profile – he wasn’t exhausted, just thoughtful. I woke with a start as Mr Cairns stopped in the driveway. I wondered if Mrs Cairns was all right, she had been way too pale earlier. When we stepped into the kitchen, my landlady’s cheeks had a more natural colour. She intently watched as Lynx drew a mindmap and explained its content. “What about you, Ken?” Lynx wanted to know, her voice devoid of fear. “Awfully tired, otherwise great.” I suppressed a yawn. I waved at Mr Cairns, knowing that he was about to tell his wife a mild version of the events. Lynx half-carried me home. I fell on the bed, oblivious of Lynx and Bud’s leaving for a quick walk, and their return a while later.